Dahl Lake is a non-motorized lake and does not allow waterskiing. There are waterskiing opportunities on nearby Norman Lake. 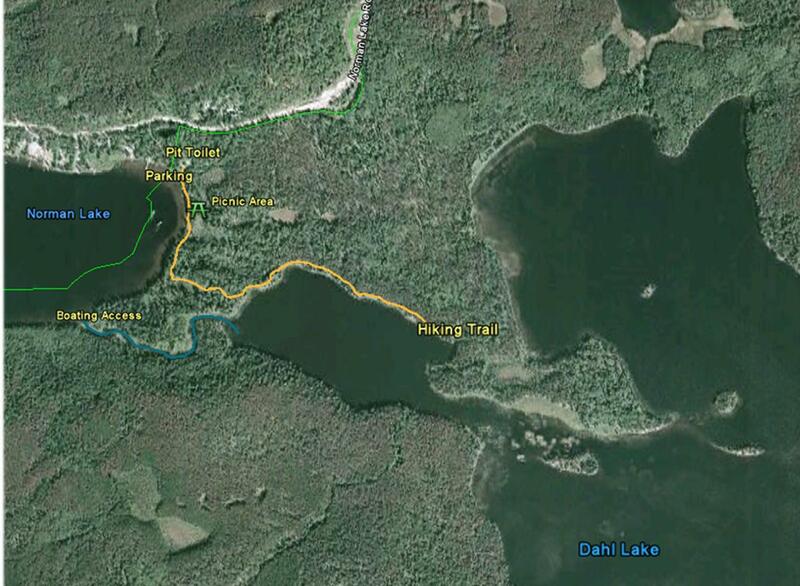 Please note that an Environmental Restoration project is currently underway on the islands on Dahl Lake. Please obey all signage. BC Parks appreciates your cooperation. Dahl Lake Provincial Park is a day-use park only; overnight camping and fires are prohibited. Dahl Lake Provincial Park is a day-use park providing a wilderness atmosphere within an hours drive of Prince George. The park has rustic picnic facilities, a sandy beach, short walking trail, and great canoeing and wildlife viewing opportunities. Motorized boats are prohibited on Dahl Lake. Dahl Lake Provincial Park is located 40Km southwest of Prince George. From Prince George travel approximately 43 Km east on Highway 16 to the junction with the Norman Lake Road. Travel south on Norman Lake Road for approximately 14.5km. Watch for the turn off to the park on your left hand side, adjacent to the “Welcome to Community of Norman Lake” sign. Parking and park access is located at the east end of Norman Lake. (NTS Map reference: 93G/14). There are opportunities for canoeing or kayaking in this park. To access Dahl Lake with a canoe or kayak, launch at the beach on the east end of Norman Lake, paddle 300 metres south along the shoreline to the creek, and proceed east through the channel about 200 metres into Dahl Lake. Motorized boats are prohibited on Dahl Lake. Anyone fishing or angling in British Columbia must have an appropriate licence. Norman Lake has been stocked with rainbow trout in the past, and although not heavily used, Dahl Lake has moderate fishing potential as well. During the winter season, visitors can ice fish on the lake. For your own safety and the preservation of the park, obey posted signs and keep to designated trails. Shortcutting trails destroys plant life and soil structure. A 300 metre trail connects Norman and Dahl Lakes. The trailhead is at the south end of the beach on Norman Lake. Another rough trail route continues on along the north shore of Dahl Lake. Hunting is allowed is some areas of the park. Please check the Hunting and Trapping regulations for more information. There are no designated swimming areas or lifeguards on duty. A sandy beach is located at the east end of Norman Lake. There is no viewing platform at this park but wildlife there are viewing areas to see wildlife. There are cross-country ski and snowshoeing opportunities on the park trails but there are no developed tracks. Part of the Bednesti trail system allows snowmobiles and skidooing. Dahl Lake has moderate fishing potential as well. During the winter season, visitors can ice fish on the lake.